I first learned about Zeki Learning from a cousin of mine who currently lives in Jerusalem about a year ago. Back then, it was still called “A Child’s Cup Full,” a non-profit created to provide employment opportunities for refugee women in Palestine. My cousin interacts extensively with refugees in the West Bank and came across CCF’s operations in one of the remote villages. My cousin was really excited about CCF’s work, because unlike the vast majority of non-profits operating in Palestine, CCF was run by a Palestinian woman in America, and actually employs Palestinian women in the West Bank to make educational toys that are sold in America. Finally, it’s a non-profit started by Palestinian women that seeks to create self-sustainable economic conditions for Palestinian women and their families. When I finally sat down and spoke with Janette Habashi via Skype, the founder and Executive Director of Zeki Learning and Professor in educational psychology at the University of Oklahoma, I was immediately taken with her enthusiasm and passion for her project, so clearly evinced even through a computer screen. It was obvious that Professor Habashi’s non-profit not only reflected her desire to improve the economic conditions of indigenous Palestinian women, but also reflected her philosophy on childhood education. She believes that integrating a child’s learning with their environment is integral in helping them develop into socially-conscious global citizens. Zeki Learning models its learning materials after the Montessori Philosophy, according to Habashi, where the child is empowered to engage his/her curiosity by initiating the learning process and the content manifests itself through this engagement. The Montessori philosophy encourages a more equitable learning environment that encourages children to be independent, to take initiative, and to be the primary driver of the educational process, with the educator stepping back from a position of power and instead simply becoming the mediator between the child and the activity. Most education systems currently operating in the world are formulated to create productive citizens who help maintain the current economic and social system of the specific society they live in, so their individual curiosity about the subject matter is largely ignored, if not discouraged. Furthermore, content is limited and highly structured, with focus on content that produces skills necessary to the marketplace. This traditional model of education largely alienates children from the learning process and eventually eats away at a child’s natural curiosity of the world. The Montessori philosophy rejects traditional educational methodologies and instead seeks to center the child as the primary driver of education; the child’s natural curiosity is encouraged and bolstered through activities that are fun and engaging, where the child learns through play and trial and error. The role of the educator is to provide an overall structure and open-ended content that’s malleable and subject to expansion by the child’s inclination. Zeki Learning not only predicates its learning materials on this model of education, but seeks to replicate this model of equitable empowerment as the core ideology in the economy as well, and indeed, as a core feature of its moral philosophy. It’s dedicated to creating a business model where everyone involved in the creation and production of the materials works together in mutual cooperation and benefit. Licensed educators with strong academic backgrounds in childhood education in the US design the toys. 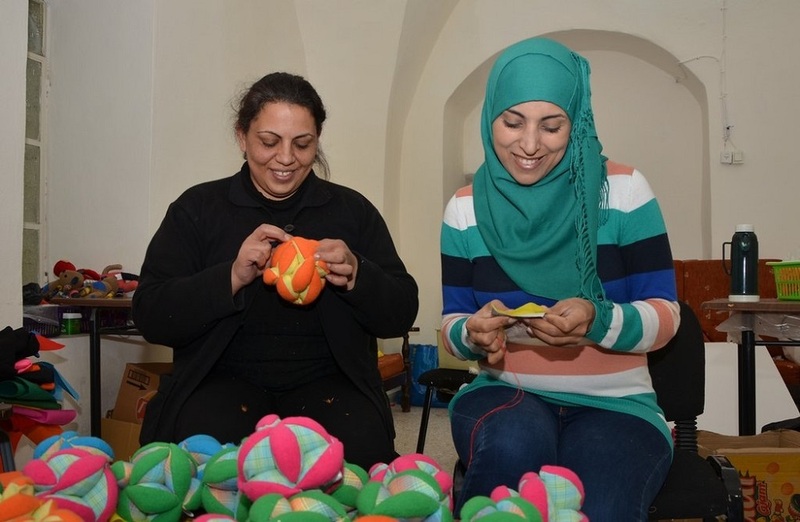 These designs are then sent to refugee women living in the Palestinian territories who use their extensive knowledge in stitching and weaving to create these beautiful, hand-made toys, which are then shipped to the US to be sold either individually to parents and childcare workers, or in bulk to school districts and daycare centers. Parents and childcare workers and educators then utilize these toys in their homes and classrooms to provide enriching, educative experiences to American children, who benefit intellectually and psychologically. All proceeds generated from sales go to providing these refugee women fair wages that they can use to provide a quality education for their own children. Indeed, Zeki Learning prides itself on being a non-profit, fair trade start-up. Indeed, all materials produced for Zeki Learning toys are locally sourced in Palestine. The women who create Zeki’s toys actually initiated the genesis of the project themselves. Habashi, was approached by several Palestinian women in the Jenin area who told her that they didn’t want aid they wanted jobs. The lack of employment opportunities in Palestine due to their struggling economic conditions has left many Palestinian families without many options to generate a steady income. The women Habashi spoke with wanted to help provide financial support to their families in a way that gave them agency, an avenue through which they can create meaning and financial stability for themselves and their families in a context often bereft of both. Inspired by these women’s determination to take control of their family’s financial welfare, Habashi expanded her non-profit to offer job training programs and employment opportunities. In its first years, A Child’s Cup Full struggled for survival, relying almost exclusively on donations from small campaigns and individual sales. However, by harnessing the power of collective fundraising campaigns, Habashi launched three successful LaunchGood campaigns that not only ensured the continued growth of their operations, but has inspired Habashi to expand her business model to include partnering with school districts, under the new appellation “Zeki Learning.” In 2017 alone, Zeki Learning has provided educational toys to over 250 classrooms in the US, and hopes to increase that number to 500 in 2018, and is the only fair trade certified educational brand in the US. Their eventual goal is to expand their employment base in Palestine to help revitalize the Palestinian economy by sourcing the entire supply chain locally. As a result, Zeki Learning is launching another LaunchGood campaign. While traditional business models often look to wealthy investors and shareholders to help fund initial costs, which often leads to future proceeds funneling to investors as “profits,” Zeki Learning wants proceeds to be reinvested back into its refugee workforce; crowdfunding campaigns provide a great alternative to traditional models of business funding, since they’re grassroots and crowd-sourced, thereby embodying the spirit of egalitarianism and social consciousness that informs Zeki Learning’s philosophy. Their business model reflects their vision for the world; traditional charities often reinforce power disparities and disenfranchise people from developing nations in a way that resembles the current trends of globalization. As mass communication and transportation increase in speed and efficiency, humanity is becoming a more integrated and global community, and our economics reflects these realities. Often-times, large, multinational western corporations outsource manufacturing to developing nations and institute terrible labor conditions and poverty wages. In the west, citizens are watching various industries disappear as manufacturing and manual labor jobs are sent overseas, creating a shortage of employment for millions of workers. In response, many have opted to reject the rise of globalization, seeking shelter in isolationist, nationalist politics. However, Zeki Learning opts for a third option, one that promotes the best features of globalization (global cooperation, inter-communal learning, diversity and egalitarianism) while rejecting its exploitative dimensions, which is mutually beneficial for everyone involved. Refugee women in Palestine get paid a fair wage to produce educational material that prepare American children to take on the economic challenges they face in the future. The moral philosophy a society adopts not only manifests itself in our interpersonal social relations, but also manifests itself in how we operate our politics and our economy. A society that values egalitarianism, diversity, equality and peaceful, mutual cooperation tends to eschew educational models that emphasize a top-down power structure where the role of the educator is simply to dictate pre-packaged content to a group of students whose only role is to passively accept that information as unquestioned truth that needs to be memorized and regurgitated. If the Montessori Philosophy seeks to center the child as the driver and agent of his/her own learning experiences, then Zeki Learning hopes to take that one step further and incorporate the child’s environment into the educational process in order to make them more socially conscious global citizens. Not only is the child’s curiosity, creativity and intellect engaged in the classroom, but he/she will also learn to channel that creativity and curiosity towards the environment in which the child lives, allowing him/her to be best equipped to take on the challenges of the world as an adult. For many, the last ten days of Ramadan is when Muslims around the world begin giving zakat (charity.) While you are considering which charity to give to this year, I highly encourage you to consider giving to Zeki Learning through their Launchgood campaign – it is zakat eligible.